Overview - Douglas Elmore is an alcoholic writer and caretaker haunted by visions of his dead wife and pursued by supernatural forces bent on revenge for his past deeds. When tenants start turning up dead in the hallways and stairwells of his brownstone apartment building, Douglas suspects a strange but sexually alluring homeless prostitute named Karna who sleeps in his basement by day and prowls the empty city by night. But as the bodies pile up, Douglas is torn between his growing obsession with Karna and the threat of becoming a prime suspect in a murder investigation. Douglas must find the origin of the evil residing in the old Hagstone building before the secrets of his past return to destroy him. There's a fine line between creepy and laughable. In fact, I didn't actually realize how fine that line was until I started watching 'The Hagstone Demon.' A low budget, indie horror flick, the film features a very odd tone that is alternatively funny and extremely unsettling. The question is, are we supposed to be laughing? At times the humor seems deliberate and at other times it seems unintentional. Well, after listening to the included commentary track I can definitively say that the answer is… yes… I think… maybe. To be honest I'm still not sure, but regardless of whether or not the piece is meant to be taken seriously or not, it's far too uneven to work. While there are some creepy images and sequences, the movie never really finds an identity of its own, often relying on stylistic devices and plot points that all feel very familiar. Isolated moments are quite effective but the story grows rather tedious, leading to an ambiguous yet pedestrian climax. The plot follows Douglas (Mark Borchardt) an apartment building caretaker and former reporter who is struggling to cope with the recent suicide of his wife. When a prostitute (Nadine Gross) moves into the building, strange happenings start to occur and bodies begin piling up. As nightmarish hallucinations and visions fill Douglas's mind, it's gradually revealed that this "lady of the night" might actually be a demonic succubus. With the aid of his priest bother in law (Sasha Andreev) and pretty neighbor (Cyndi Kurtz), Douglas takes on the flesh obsessed monster, but dark secrets about his own past might end up damning them all. The main problem with the film is its inconsistent tone and uneven performances. The movie has a deliberately quirky quality that counterbalances its creepy imagery, but many performance choices seem to lean toward an unintentionally amateur feel. Borchardt has a certain naturalistic charm but his acting wobbles around from passable and fitting to downright awful. Other cast members suffer similar fates, and the script and direction really don't help. The story has a decent setup but as we move closer and closer to the conclusion, various twists and revelations end up being pretty bland. The explanations for the weirdness aren't as interesting as the weirdness itself. The slow tempo that worked well in the first half also starts to overstay its welcome, and the movie ends up feeling longer than its 96 minute running time would imply. Director Jon Springer actually does an admirable job of creating some disturbing and moody images. Certain sequences are truly unsettling with a grimy, dirty black and white aesthetic that heavily evokes past classics like David Lynch's 'Eraserhead.' Unfortunately, this very Lynch-esque quality is almost too overt, and at times it seems like Springer is simply cutting and pasting that director's visual style into his own story. Still, there is no denying the skill and power of some of the sequences presented here, and the film actually works best when it's at its most abstract. Color is used in dreamy, ethereal flashbacks and one Super 8 scene involving a satanic ritual is particularly moody and memorable. Some gross creatures and effects are also fairly well done, especially considering the film's low budget. My experience watching 'The Hagstone Demon' was rather erratic. At first I found myself laughing quite a bit at various (intentionally?) humorous line readings and situations, but as the film progressed I was actually absorbed by its dark imagery and style, until I was finally bored by its generic third act and put off by its nonsensical climax. The filmmakers' hearts are in the right place, but with sometimes amateur performances, scripting, and direction, the movie lacks a cohesive tone. Big fans of low budget, Lynch-esque horror films might want to take a look, but others will likely want to skip this one. 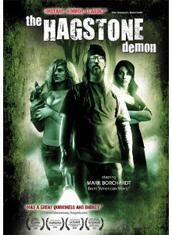 Pacific Entertainments brings 'The Hagstone Demon' to Blu-ray on a BD-25 disc housed in a standard case. After some logos and warnings, the disc transitions to a standard menu. The movie is provided with a 1080p/AVC transfer in the 1.78:1 aspect ratio. Based on pictures of the camera used in production that are included in the stills gallery, the movie seems to have been shot digitally but manipulated after the fact to look like film (though one sequence was shot on Super 8). With this in mind the image has a rather cheap and underwhelming appearance that lacks substantial detail. Some seemingly artificial grain and specks are visible throughout which help to enhance the movie's dirty, grimy atmosphere. Clarity is OK, but the image is soft and fine detail is very average. The majority of the film is presented in black and white, but there are a few instances of color which are intentionally stylized. Contrast is high giving the picture some occasional pop and black levels are nice and deep. I also detected some sporadic but not overly troublesome posterization. The movie's low budget roots are obvious, and while Springer does an admirable job of creating a disturbing aesthetic, for the most part, the video is underwhelming. The audio is presented with English Dolby Digital 5.1 and 2.0 tracks with no subtitle options. Though not lossless, the sound design is actually well done, bringing an effectively creepy atmosphere to the proceedings. Dialogue is clean but there are some occasional crackles. Directionality is solid and the film makes good use of various eerie ambient effects, forming an uncomfortable soundscape. Surround use is good, with lots of disturbing sounds and music cues filling the rears in both subtle and obvious ways. Dynamic range is decent and bass activity is present with some sinister low rumbling. Balance is good and speech is prioritized well. Much like the visuals, the sound design takes its cue from the works of David Lynch, providing an unsettling aural experience that enhances the mood and tone of the picture. Some of the choices lack finesse, but this is a mostly strong, though unfortunately lossy track. Pacific Entertainment has put together a decent collection of supplements, including a commentary, deleted scenes, and a short film. All of the extras are presented in 1080p with Dolby Digital 2.0 sound and no subtitles unless noted otherwise. Commentary with Mark Borchardt and Jon Springer - The director and star provide an informative and very laid-back track. Borchardt comes across as one of the most gracious and polite people I've ever heard on a commentary and constantly thanks the director and other performers throughout. Some talk is dedicated to locations, the cast, the expensive sound design, cat allergies, and the film's themes. At one point Springer mentions that the movie tends to work best when audiences let themselves laugh a lot and just roll with it. At first this seemed to reinforce my own more comical interpretation of the film, but later comments made by the pair appear to contradict this and I still think that many scenes I found funny weren't really meant to be taken so. Dollface (HD, 20 min) - This is a creepy short film directed by Jon Springer. Similar in aesthetic and tone to 'The Hagstone Demon' there is again lots of Lynch inspired imagery, heavily evoking 'Eraserhead.' While much like Spinger's feature, I didn't really care for the short, there are some unsettling and memorable images toward the end. Video Interview with Mark Borchardt (HD, 9 min) - Actor Mark Borchardt is interviewed along with director Jon Springer. They both discuss what it was like working together and elaborate on their artistic methods and the film's noir style. They also discuss Borchardt's rather blunt personality, and indeed the actor ends the interview by complaining that he's hungry. Deleted Scenes & Alternate Opening (HD, 6 min) - Three deleted scenes (including an alternate opening) are viewable together with chapter breaks. The new opening features more footage of the satanic ritual seen later in the film and the rest of the deleted material is pretty disposable. Photo and Artwork Illustrations (HD, 3 min) - A slideshow of behind-the-scenes stills and artwork is included, set to music and effects from the movie. Though sporadically creepy and entertaining, 'The Hagstone Demon' is at times unintentionally funny and banal, leading to an uneven and pedestrian attempt at David Lynch-esque levels of horror. Certain sequences and images are actually very effective, but as a whole the movie never really works. Video quality is average, and while lossy, the audio mix provides some eerie atmosphere. Supplements are solid, but this is a release that will only appeal to big fans of similar indie horror efforts.